"a delicious little book packed with erudition and pleasure . . ."
Jonathan Silvertown demonstrates that natural selection—Darwin’s big discovery—and artificial selection whereby crops and animals have been domesticated by us and progressively refined to suit our tastes are analogous processes, both dependent on variation among individuals and the heritability of a proportion of this variation is heritable. 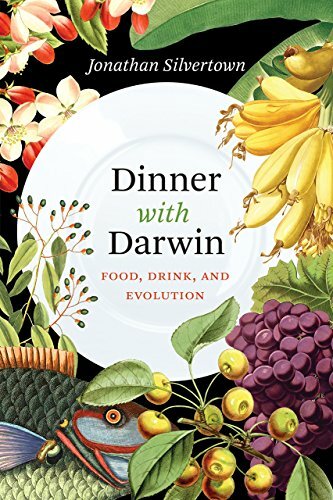 The picky eater dining with Darwin is not required to take on the whole 14-chapter menu but can “dine à la carte.” Some guests will no doubt want to start with Wine and Beer: Intoxication though from the point of view of digestion it is probably better to start with our emergence from Africa along coastal routes marked by the middens of shellfish waste, and our distinguishing ourselves from chimpanzees by learning to cook. Chimps also eat shellfish but don’t cook it. Silvertown treads the balance between scientist and popularizer rather skilfully only once or twice perhaps providing too heavy a diet of science for the average reader. While much of the material is familiar, the presentation is completely fresh and often funny. (Do not miss his groan-inducing pun on ball-breaking in the meat course). In the soup course he presents the genetics behind the distinct tastes we recognize: salt, sweet, sour, bitter, and since 1909 the umami. The fish course stimulates reflections on olfactory receptor cells which may influence your taste or otherwise for coriander. He has many interesting things to say about evolution as a non-directional process not “like a car that has no reverse gear” with genes for traits that have lost their function through evolution becoming random pseudo-genes. This means for example that in cats and other carnivores the gene for the ability to taste sugar no longer functions, though it functions in bears who eat both meat and berries. And does not hesitate to present some of the unsolved riddles of evolution, such as the “ domestication syndrome” first noticed in 1868 by Darwin, who remarked that quite unrelated domesticated animals including dogs, pigs, cattle, rabbits, guinea pigs, and horses share a common set of traits namely less seasonal breeding, piebald coats with patchy pigmentation, floppy ears, shorter muzzles, smaller teeth, smaller brains, curly tails, and juvenile and docile behaviour. While airing a number of hypotheses including that of the “neural crest,” which seems the most likely, Silvertown concludes inconclusively that these seemingly ill-assorted traits are incidental byproducts of the main event of domestication which is selection for docile behavior. He introduces relatively painlessly some of the recent thinking on horizontal gene transfer (HGT) in which some bacteria and viruses are adept, and the genome editing system CRISPR Cas9 which enables a bacterial cell to recognize viral DNA sequences, snip them out, and repair the damage. This mechanism enables “editing of DNA sequences much as one would use search-and replace function in a word-processing programme to edit a document” and is now being used in medicine to repair faulty genes that cause inherited diseases in humans such as cystic fibrosis. His last chapter presents a convincing case that genetic modification is a natural progression of our evolutionary relationship with our food from domestication of wild cereals in Neolithic period which kicked off the “population time bomb,” through the Green Revolution of the 1960s and 1970s that multiplied the yield of major cereal crops—wheat, rice, and corn—by 50% or more. “While GM food has not harmed anyone the irrational opposition to it has almost certainly done so” . . . by, for example, denying poor farmers access to GM varieties that are resistant to pests and diseases. Jane Haile is a staff reviewer with New York Journal of Books.